Harvey Milk Plaza and Rainbow Flag (Castro and Market Streets) – Memorializing San Francisco politician and gay rights activist Harvey Milk, this small plaza is a neighborhood gathering point for marches, demonstrations and voter drives. 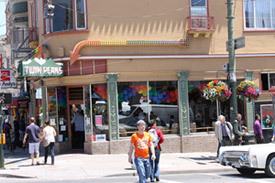 It also is the location of a giant rainbow pride flag (20 feet by 30 feet) that waves over the Castro. On the evening of Harvey’s and Mayor George Moscone’s assassinations on November 27, 1978, thousands of Castro residents and other grieving San Franciscans gathered at the plaza. With tears, candles and flowers, they somberly marched down Market Street to City Hall in memory the slain leaders. The plaza, renamed for Harvey in 1985, serves as the starting point for his memorial candlelight march every year on November 27th. 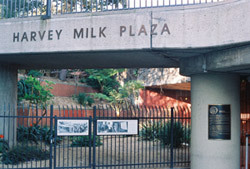 The lower level of the plaza, which also provides access to the southern entrance of Muni Metro’s Castro Street station, has a small display of photos from Harvey’s life and a plaque giving a brief history of his accomplishments. On the upper level of the plaza, a 70-foot flagpole flies the huge rainbow flag, visible for miles around. At its base a plaque commemorates San Francisco’s lesbian and gay state and local elected officials. The LGBT rainbow flag was first designed and created in San Francisco by Gilbert Baker, a young gay fabric artist who in 1978 was challenged by his friend, Harvey Milk, to sew a symbol of pride for the gay community. Inspired, Baker dyed and stitched together eight fabric strips of brilliant color. The first few rainbow flags appeared at the 1978 Gay Freedom Day Parade to positive acclaim. The flag was reduced to six stripes to make production easier (hot pink and indigo were eliminated) and by 1979 rainbow banners were lining the parade route. 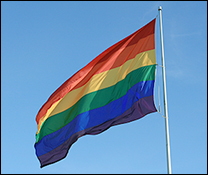 The flag quickly was adopted by the LGBT community around the world as a symbol of pride and diversity. 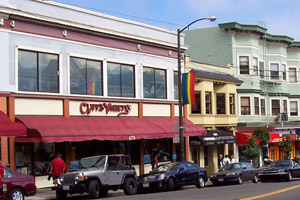 In the Castro and Upper Market area, rainbow flags can be seen everywhere: attached to light poles as banners, posted in bars, on merchandise in shop windows, and hanging from the front of people’s homes. The large flag at Harvey Milk Plaza and the rainbow banners on street poles throughout the district are paid for and maintained by monies contributed yearly by the Castro Street Fair and the Merchants of Upper Market and Castro (MUMC). One of the busiest intersections in San Francisco has become known as a place to rest and take a break from the surrounding city clamor. Jane Warner Plaza, located at the intersection of Castro, 17th and Market streets, is a tiny green oasis that since its launch in the Spring of 2009 has become the most popular meeting place in the Castro district. Surrounded by a thin screen of trees and flowering plants in planter boxes and furnished with cheery red café tables and chairs, the plaza is a perfect place to sip a cup of coffee, chat with a friend, and watch the world go by. The Castro Theatre (429 Castro) – The huge, 1930s neon sign reading “CASTRO” started out as advertising for this neighborhood movie palace but in the 1970s the flamboyant sign became the symbol of the area’s emergence as gay Mecca. Tourists who only pause long enough to have their picture taken in front of The Castro’s sign and campy Mexican cathedral façade are making a big mistake: the interior is even more fabulous! Designed by architect Timothy Pfleuger, the inside is done in ornate 1922 Spanish Revival style, with colorful Italianate murals and an art deco Moorish fantasy chandelier and ceiling. 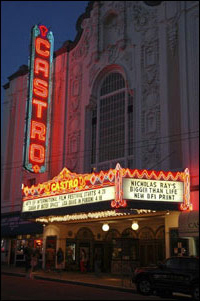 The Castro was built and continues to be run by the Nasser family, who opened their first Castro theatre, a Nickelodeon, in 1907. One of the U.S.’s few remaining 1920s movie palaces in operation, the theatre is renown not only for its retro style but its innovative programming of old and new movies, and special events (film festivals, concerts by the Gay Men’s Chorus, live interviews of aging movie stars, etc.). Each evening before the main attraction is shown, the house organist plays the theatre’s mighty Wurlitzer pipe organ, closing the mini-concert with a lively version of “San Francisco.” All this for the price of a movie ticket! 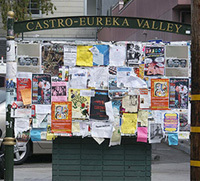 For a program list, upcoming special events, history and other information, see www.castrotheatre.com. Harvey Milk Mural & Former Location of Harvey’s “Castro Camera” Store (575 Castro) – Harvey Milk (1930-1978), the first openly gay elected official of any large city in the U.S., lived and worked in the Castro neighborhood, and was instrumental in the rise of gays as a political force. Originally from New York state, he spent his twenties as an investment banker on Wall Street and in his thirties as an assistant director in the New York city theatre community. In 1972, Harvey moved to San Francisco where he was free to indulge his hippie sensibilities and live openly as a gay man. He and his lover, Scott Smith, opened Castro Camera shop, which soon became the hub of Harvey’s community activism. Living in the apartment above his store, the outgoing and witty Harvey quickly became friends with local merchants, his customers and neighbors. Harvey spent so much time talking to area residents and trying to solve their problems that his jesting, self-proclaimed title as the unofficial “Mayor of Castro Street” soon became reality. When he discovered that the local merchant association wouldn’t let in gay members, Harvey organized the rival Castro Village Association, which sponsored the first Castro Street Fair in 1974, drawing 5000 attendees. He also helped found a political club for gay Democrats. Frustrated by city bureaucracy, the pony-tailed, openly-gay Harvey ran for S.F.’s Board of Supervisors in 1973, using Castro Camera as his campaign headquarters. He lost the election but kept campaigning in the Castro, telling the community they needed gays in office and that the struggle for gay rights is “the fight to preserve your democracy.” Cutting off his ponytail, he ran again for supervisor in 1975 and for state assembly in 1976, losing both elections but gaining followers. His tenacious community organizing, Castro voter registration drives, and coalition building finally paid off in 1977 when he was elected to the S.F. Board of Supervisors, the first openly gay candidate to be endorsed by local firefighters, construction workers and Teamsters. The celebration at Castro Camera on election night was jubilant, blocking the sidewalk and flowing out into the street. Barely a year later, Harvey’s political career as an advocate for human rights was cut short by an assassin’s bullet. In 1998, twenty years after Harvey’s death, city officials and his friends dedicated a small mural of Harvey on the wall above his old shop. It shows Harvey leaning out a window with his usual big smile, wearing a t-shirt inscribed with one of his favorite admonitions: “You gotta give ‘em hope!” A bronze memorial plaque, describing Harvey’s accomplishments, is inserted in the sidewalk in front of the location. Pink Triangle Park and Memorial (Intersection of Castro, Market and 17th Streets, across the street from Harvey Milk Plaza) – This triangular shaped mini-park is the first permanent, free-standing memorial in America to the thousands of gay, lesbian, bisexual and transgendered people sent to Nazi death-camps in World War II. The park’s centerpiece is an arrangement of 15 sierra-white granite pylons, each inlaid at the top with a pink triangle. Together, the pylons form a larger triangle set in pink gravel, with flowers and shrubbery surrounding it. During the Nazi era (1933-1945), an estimated 15,000 gay men and women were sent to concentration camps, where many of them suffered torture and death. Each pylon in the park represents 1000 lives. The triangle theme recalls the Nazis forcing gay men to wear pink triangles sewn to their clothes as an identifier and badge of shame. Lesbians, as well as prostitutes and women who refused to bear children, were forced to wear black triangles. Pink Triangle Park was created in 2003 by the Eureka Valley Promotion Association, a neighborhood group that says the park serves as “a physical reminder of how the persecution of any individual or single group of people damages all humanity.” For more information, see pinktrianglepark.org. 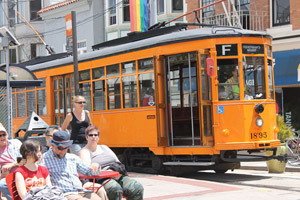 Historic Streetcars(Castro end of the line is located at the intersection of Castro, Market and 17th Streets) – The brightly painted vintage streetcars moving along Upper Market and 17th to stop at Castro Street are a daily reminder that public transit has long played an important part in this neighborhood. From the 1920s through the 40s, four side-by-side streetcar tracks ran up Market, from the Ferry Building to Castro Street. The noise from the streetcars clattering along them was referred to by locals as “The Roar of the Four.” The four tracks were reduced to two by the 1950s and plans were laid in the 1960s to upgrade Market Street by moving the streetcar tracks underground. The Muni’s light rail subway was completed in the early 1980s and it appeared that streetcar rails would soon disappear from Market Street. Before that happened, a Historic Trolley Festival was held during the summer of 1983, with old street cars from around the world running up Market to Duboce Street and back. The festival was slated to be a temporary stand-in while the city’s beloved but aging cable car system was shut down for an 18 month overhaul. 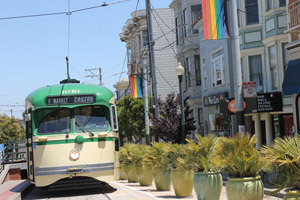 However, it proved so popular with both tourists and locals, who enjoyed commuting on the classic streetcars, that the festival was extended for five summers and the city approved a permanent F-Line, to run up Market Street to Castro. BART – BART does not go directly to the Castro/Upper Market so riders need to transfer to MUNI Metro or streetcar at these stations: Embarcadero, Montgomery, Powell, or Civic Center. Built in 1892, the four-story, multi-towered house has an eclectic architectural style that has been described as “Baroque-Queen Anne.” It boasts a magnificent entrance, with stained and etched glass panels in the doors, and has an interesting exterior shingle pattern, where bands of plain shingles alternate with scalloped shingles. 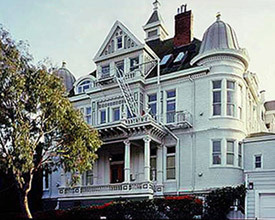 The mansion was built by Alfred “Nobby” Clarke, an Irish sailor who came to San Francisco in 1850 and sought his fortune in the California gold fields. He didn’t strike it rich, however, until 1856, when he joined the S.F. Police Department. Retiring from the department 31 years later with an alleged $200,000 in savings, Clarke purchased 17 acres in rural Eureka Valley (now known as The Castro) and used $100,000 to construct his ornately shingled mansion. Alas, Mrs. Clarke refused to live there: some locals say she was embarrassed by the house’s ostentatious style, while others maintain she objected not to the mansion but its unfashionable location. By 1904, the building had become the “elegant and commodious” California General Hospital. At later date it was turned into a rooming house for Standard Oil employees, and finally became what it is today: the most unique apartment house in the Castro. Cliff’s Variety and Cliff’s Annex (471 and 479 Castro Street) – One of the oldest and most beloved stores in the neighborhood, Cliff’s Variety has built a devoted customer base by providing great service, stocking over 65,000 items, and giving back to the community. The DeBaca family, which still runs Cliff’s, opened their first small store on Castro in 1936, selling magazines, cigars, notions, and candy. During the next 35 years, they moved twice to bigger Castro St. stores as the business flourished and their stock of merchandise expanded to include hardware, home improvement materials, housewares, art and craft supplies, toys, Halloween costumes and more. The store’s annual Halloween costume contest and children’s parade, held from 1946 to 1979, is remembered warmly by older Castro residents. In 1971, the DeBaca’s moved to their current building, which was erected in 1910 as the Castro Theatre. As the 1970s gay transformation of the Castro occurred, they added products their new customers wanted, such as supplies for restoring Victorian houses and feathered boas and tiaras for drag costumes. The Cliff’s Annex, next to the main store, opened in the late -80’s, offering fabric, linens, bedding and bath accessories. Cliff’s has a long tradition of elaborate and eyecatching window displays, especially at Halloween and Christmas. For more information, see www.cliffsvariety.com. Upper Market is awash in trendy resale shopping! Men’s and women’s clothing in the Castro, from upscale vintage clothing to everything that one might need to supplement their wardrobe, Castro/Upper Market has it all. Eureka Valley / Harvey Milk Memorial Branch Library and José Sarria Court (1 José Sarria Court at 16th and Market Streets) – In 1981 the S.F. Library Commission officially changed the name of the Castro neighborhood’s branch library to the Eureka Valley/Harvey Milk Memorial Branch Library to honor the slain Supervisor and gay activist. 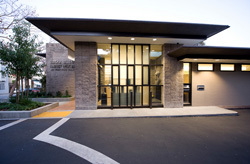 The library houses a special collection of Gay/Lesbian/Bisexual/Transgender (GLBT) materials, which includes lesbian fiction, gay men’s fiction, books about/for gay teens, nonfiction, periodicals, newspapers and videos. 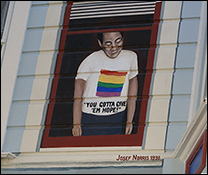 Across the street (facing the library, on the back wall of the Bagdad Café) is a huge mural featuring images from the neighborhood’s gay history including the Gay Freedom Day march, a rainbow flag, and the AIDs crisis. Twin Peaks Bar (401 Castro Street) – In 1973, the Twin Peaks Bar took the bold step of uncovering its large, wrap-around plate glass windows, becoming the first openly gay bar in San Francisco whose customers could be seen by, and see, passersby on the street. For San Francisco’s gays the decades of hiding in dark bars and enduring humiliating police raids for “disorderly conduct” were over. Many other bars and gay meeting places in San Francisco, and around the world, soon followed suit, showing they were “out and proud.” The bar remains popular with a slightly older crowd who appreciate a nice place to have a conversation, a good drink, and front-row seats for watching the crowd go by at the busy intersection of Castro and Market. For more information, see www.twinpeakstavern.com. An estimated 48,000 Victorian houses were built in San Francisco between 1849, when the Gold Rush population explosion started, and 1915, the date some architectural historians pick as the end of construction of Victorian-style buildings. Stylistically, almost all of the San Francisco Victorians followed architectural fashions on the U.S.’s east coast, with three styles in predominance: Italianate in the 1870s and 1880s, Stick Eastlake in the 1880s, and Queen Anne in the 1890s. By the 1880’s, the city’s Victorians were known for their flamboyant exteriors. San Franciscan’s festooned the front of their houses with every possible architectural flourish, including false fronts, crests, ornamentation, scrolls, fretwork, stained glass, cut and beveled glass, and rosettes. Architectural details, as well as the different features of the house, were highlighted by painting each one a different bright color. “Red, yellow, chocolate, orange, everything that is loud is in fashion,” commented the California Architects and Builders News in 1885. Moving into the 20th century, styles began to change. Thousands of redwood Victorian’s burned in San Francisco’s 1906 Fire and Earthquake, and most of their replacements were more sober. In the 1950s and 1960s, 28 square blocks of Victorians in the Western Addition neighborhood were deemed urban blight and fell to the city’s redevelopment bulldozers. Hundreds more vanished one-by-one, eliminated by modern construction. Of the approximately 16,000 that remain, it is estimated half had their gingerbread millwork and decorations removed so that their exteriors could be modernized with the latest look: stucco in the 1920s, asbestos shingles in the 1950s, and aluminum siding in the 1960s. In the late 1960s, a few brave San Franciscans began restoring their Victorians to gaudy glory. Their neighbors watched in amusement or horror, comparing the houses to Christmas trees and psychedelic hallucinations, while six or even 10 loud colors were applied. But some locals were intrigued and began to follow suit. Young gay men, moving into careworn Eureka Valley in the early 1970s for the cheap housing, helped propel the Colorist Movement. They highlighted the whimsical gingerbread details of their new homes with multi-colors, revitalizing buildings that had been camouflaged for years under coats of white or gray paint. When other San Franciscans realized that restored Victorians sold for a lot more money than the un-restored variety, the coloring craze was on. An industry has grown up around restoring Victorians, including painters that specialize in color designs, suppliers of materials (both authentic and reproduced), and providers of specialized services, such as restoring Victorian lighting and stained glass windows. The movement has also resulted in a number of preservation societies dedicated to conserving the buildings. Beautiful examples of Victorian architecture abound in the Castro. For a gorgeous example of a Queen Anne flavored mansion, complete with towers, balconies, and art glass windows, walk by “Nobby” Clarke’s Mansion (250 Douglass Street). Another outstanding Queen Anne located in the heart of the Castro is the McCormick House (4040-4042 17th Street between Castro and Collingwood Streets). For good examples of Italianate, Stick Eastlake and Queen Anne styles, walk up Liberty Street, between 20th and 21st. To see the inside of a Victorian, you’ll need to leave the Castro and visit the Hass-Lilienthal house (2007 Franklin Street ), a magnificent 1886 Queen Anne filled with Victorian furniture and artifacts that is a museum open to the public. For more information, see www.sfheritage.org. Harvey Milk Civil Rights Academy (19th at Collingwood Street) – Known as “Douglass Elementary School” during Harvey Milk’s time in the Castro, this urban public school was renamed “Harvey Milk Civil Rights Academy” in 1996 and took as its core values academic excellence, teaching tolerance and non-violence, celebrating diversity, and building a strong family-school-community connection. The small, alternative elementary school is located a block from Harvey’s former camera store and residence. The kids have decorated the school’s front wall with a variety of very colorful mosaic murals. The academy teaches its 200 racially diverse students, who come from throughout San Francisco, a philosophy of tolerance and empathy similar to the one that the school’s namesake espoused. Harvey spent much of the last year of his life campaigning throughout California against a measure that would have banned openly gay people from working in the public school system and saw it successfully defeated a few weeks before his assassination. Like all San Francisco public schools, the Academy is under-funded and parents at the school are constantly raising money to fill in the gaps. To contribute to the school or for more information, see www.harveymilk.com. 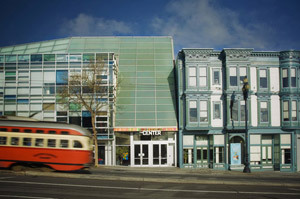 San Francisco Lesbian Gay Bisexual Transgender Community Center (1800 Market Street at Octavia) – San Francisco’s Center is the first in the world to be built from the ground up specifically for the LGBT community. It also is one of the largest in the world: 40,000 square feet of lounges, classrooms, meeting rooms, a restaurant, offices of 11 non-profit organizations, a cybercenter, performance and art exhibition spaces, and more. Opened in 2002, the Center serves thousands of newcomers and tens of thousands of San Francisco residents six days a week; it is closed on Sunday. It provides a vast array of programs and services (legal, cultural, health, social and educational). The large lobby’s main desk is staffed by helpful folks who answer questions and direct visitors to the services they are seeking. The lobby contains tables and bulletin boards packed with flyers, brochures and newsletters on groups, events, and assistance for all spectrums of the gay community. It also has posted a listing of the meetings, classes and other events scheduled to take place that day at The Center. For more information, see www.sfcenter.org.